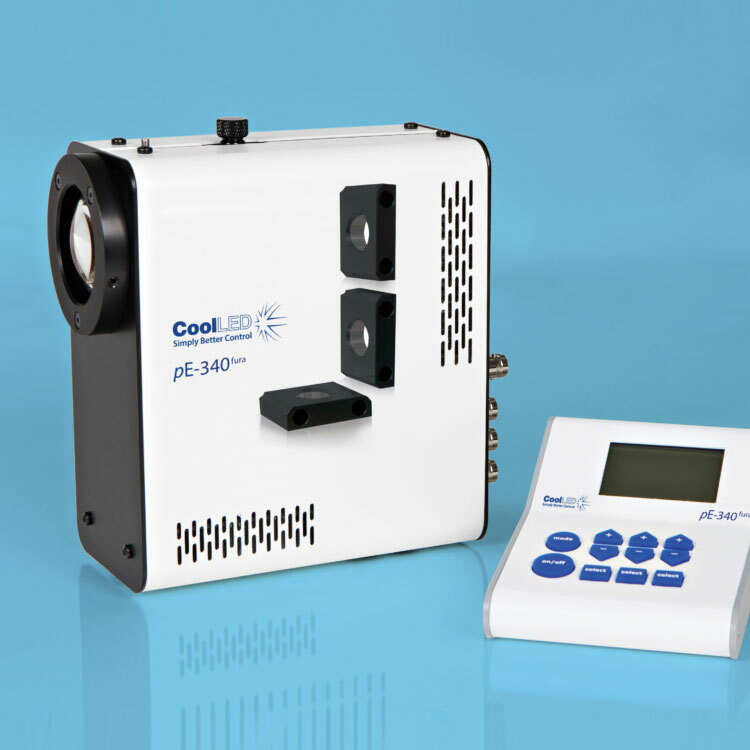 The 340nm and 380nm LED illumination system provides the optimum excitation wavelengths for Fura-2-based calcium imaging allowing high-precision, stable, high-throughput imaging with video-rate time resolution. The images above show a field of cardiac myocytes (heart cells). The cells were loaded with Fura-2 using standard conditions (i.e. incubation with 2 micromolar Fura-2 acetoxymethyl ester for 30 minutes, followed by an additional 30 minutes for de-esterification. Images were obtained by Martin Bootman and Katja Rietdorf, School of Life, Health and Chemical Sciences, The Open University, UK. Until recently, the response time of illumination systems for Fura-2 imaging have been limited to milliseconds due to mechanical switching of the wavelengths in arc lamp and monochromator systems. However, the new pE-340fura can be controlled via convenient BNC TTL connections for precise illumination control in as little as 20 microseconds. Spontaneous Ca2+ events are induced in Mg2+-free HBS. (A) Representative trace from a single hippocampal neuron of Mg2+-free induced Ca2+ events imaged at 0.5 Hz and (B) representative trace from two hippocampal neurons of Mg2+-free induced Ca2+ events imaged at 24.39 Hz. Using the new pE-340fura LED Illumination System, less Fura-2 dye can be loaded into the cells whilst still maintaining the same measured calcium concentration and good signal-to-noise ratio. The reduction in required dye not only improves cell-viability due to reduced dye toxicity, but also results in a cost reduction per experiment. Comparison of Ca2+ increases obtained from the application of trypsin (100 nM) to tsA-201 cells loaded with different concentrations of Fura-2 AM. Work by Sandrine Prost et al., from the University of Edinburgh, has shown that with independent wavelength controllable LED sources, signal-to-noise is dramatically improved over bulb systems and even over some available white wide spectrum LED sources. High levels of autofluorescence and fast photobleaching of specific fluorescence when illuminating Qdots with Metal Halide. 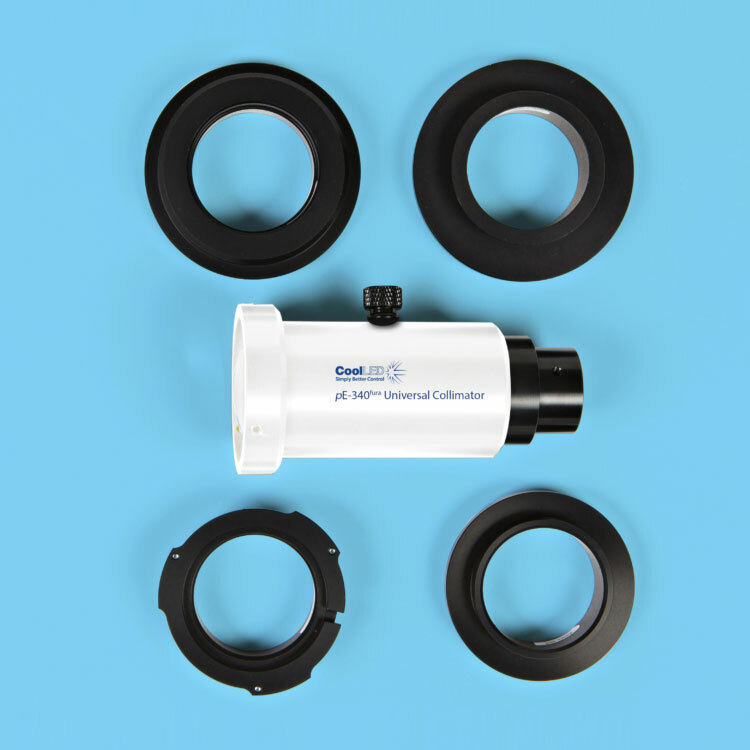 Direct-fit for connecting to a microscopes – by selecting from a range of microscope adaptors which covers all current and most older models. A simple once only adjustment will allow optimisation to the optical path of the microscope. Liquid Light Guide with a fixed 3mm diameter, liquid light guide. 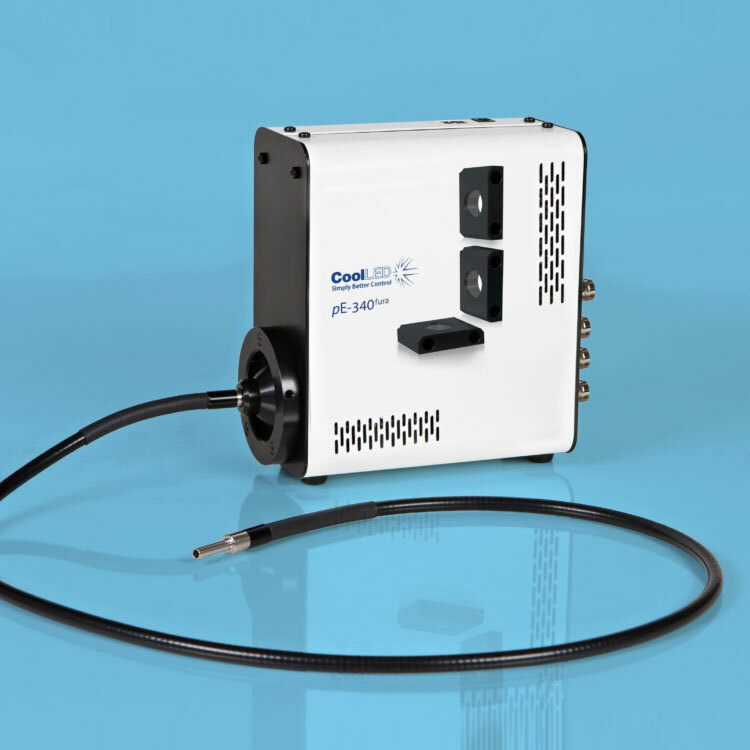 An optional pE-340fura Universal Collimator can be specified in conjunction with a microscope adaptor if required, containing optics optimised to transmit the 340nm.